411 BCE. That’s when Aristophones’ comedy Lysistrata was first performed in Athens, Greece. That’s a hell of a long time ago but classics are timeless and that’s why they’re performed still today. Though they don’t need to be updated and modernized, it’s always fun to see what happens when they are and sometimes they work and sometimes they don’t, but it’s interesting to see what each era does with them. Red Branch Theatre Company has taken a chance on a modernized classic with their latest production of Lysistrata Jones with Music & Lyrics by Lewis Flinn and Book by Douglas Carter Beane, Directed by Stephanie Lynn Williams with Music Direction by Dustin Merrell and Choreography by Brandon Glass, and it’s worked out nicely for them. Lysistrata Jones has taken the story of Lysistrata and taken it out of Ancient Greece to modern day Athens University where the basketball team isn’t really trying that hard when the title character enters the scene and simply wants them to try harder; to want something, and until they do, the girls decide, with the coaxing of Lystrata… no funny business in the bedroom! This leads to an age-old battle of the sexes that involves no funny business in the bedroom and seeking advice from the Madame of the local brothel with some self-realizations along the way. Scenic Design by Bill Brown is simple, unit gymnasium set which is wise considering the ample but intimate space at Red Branch. His use of bright colors and movable stairs to help create individual settings is both clever and practical making for smooth, easy transitions between scenes, keeping the flow of the piece moving nicely. Stefany Thomas’ Costume Design is authentic and gives each character his or her own style and helps bring out each character’s personality and charm. Brandon Glass’ Choreography is top-notch in this high energy, up-tempo piece. The cast looks like their having a great time and Glass’ choreography is fun to watch. The ensemble numbers are tight and well-rehearsed and he seems to know his actors and matches his choreography to enhance the abilities of this cast. Glass is to be commended for his current and varied choreography in this production. Music Direction by Dustin Merrell is superb and he brings this exciting and energetic score off the page and onto the stage. With songs that stick to the brain like “No More Givin’ It Up,” “You Go Your Way,” and “The Writing on the Wall,” Merrell is working with a contemporary style with (at times) a heavy hip-hop influence but he and his cast pull it off nicely. The band, though a bit muted because of the space, is tight and well-rehearsed and gives a praiseworthy performance. Director Stephanie Lynn Williams takes the helm of this production and has given us a delightful evening of theatre. She has a good comprehension of the material and though it’s been twisted and re-imagined, the story still holds tight. It’s a show full of fluff, but Williams seems to have taken it seriously enough not to just throw it away. She’s taken the time to bring the gender-based issues and message of self-realization out of the fluff. She keeps the action moving and the transitions smooth which help keep the pacing consistent. Casting is excellent and, overall, Williams has a splendid final product. The entire ensemble of this piece is spot on. They are dedicated and are working hard to give 100% but are all having a blast up on the stage. The “boys” Cinesias (Andrew Overton), Tyllis (Jason Quackebush), ‘Uardo (Diego Esmolo), and Harold (Elad Ness) all have great chemistry and embody their very different characters. A standout is Overton as the “play-a” Cinesias who has his character down pat and is hilarious as the young man who can’t seem to figure out who or what he is. Taylor Witt takes on the role of Xander, the social-conscious semi-activist who isn’t a member of the team but crosses paths with our heroine and teaches her not to give up and to keep moving forward. He gives an authentic performance and his featured number “Hold On” is a catchy number that he performs well. The “girls,” as it were, is made of an entertaining and able group consisting of Cleonice (Tiara Whaley), Myrrhine (Victoria Meyers), and Lamptio (Angeleaza Anderson) are everything you want in a cheerleading clique but maybe a little nicer. Each of these characters are different from the next and these ladies have taken these roles and make them their own. Meyers is a believable “good girl” but lets it all out in “Don’t Judge a Book,” her featured duet with Andrew Overton. Whaley takes a commendable turn as the Latina and, though it’s obvious that Spanish is not her native language (at least that’s what it sounded like), she is dedicated to her character and has great chemistry with her fellow actors. Angeleaza Anderson is funny and authentic as the “ditzy” one of the crew. Her vocalization for the character is on point and she gives a confident performance with a good stage presence. Taylor Washington as Hetaira and Alex Levenson as Robin are definite highlights of this production. Washington takes on double duty with the character of Hetaira playing both a narrator of sorts as well as the Madame of a brothel. She not only embodies these characters wholly, her vocal stylings on her featured numbers such as “I Don’t Think So” and “Writing on the Wall” are stellar. She takes these songs and makes them her own with her booming voice and she is simply a joy to hear and watch. At the same time, Alex Levenson portrays her character, the level-headed, astute student, with great authenticity and seemingly effortlessly. There are many points in the show I completely forgot she is reading from a script because of her natural and smooth performance. Kudos to both of these actors for a job well done. Final thought… Though light and airy, I must say I thoroughly enjoyed Lysistrata Jones. It is an upbeat and current piece with a great score, catchy songs, a good script, and high-energy choreography that fits nicely in this summer time slot. The ensemble is dedicated and able and the chemistry is within the entire cast is clear. 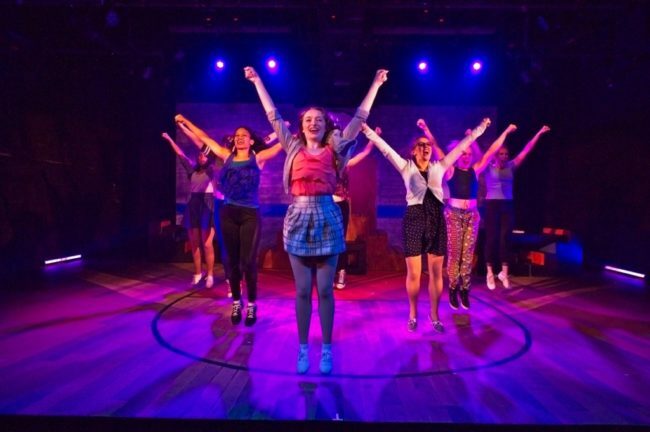 The classic tale of Lysistrata is broken down but not necessarily dumbed down and this production at Red Branch Theatre Company keeps the audience entertained and engaged. This is what I thought of Red Branch Theatre Company’s production of Lysistrata Jones… What did you think? Please feel free to leave a comment! Lysistrata Jones will play through August 26 at Red Branch Theatre Company, 9130-I Red Branch Road, Columbia, MD. For tickets, purchase them online. Tis the season for joy and merry making and the latest offering from Red Branch Theatre Company, Harry Connick Jr.’s The Happy Elf with Music & Lyrics by Harry Connick, Jr. and Book by Lauren Gunderson & Andrew Fishman, with Direction by Laura Greffen, Music Direction by Dustin Merrell, Choreography by Rick Westerkamp, Scenic Design by Gary Grabau, Costume Design by Andrew Malone, and Lighting Design by Stephanie Lynn Williams and Amy Williamson has all this and more. Grab the kids, nieces, nephews, or any young person in your life and check out this fun story of never giving up and discovering one of the true meanings of Christmas. Scenic Design by Gary Grabau is simple yet innovative for this production and the clever use of levels keeps the set interesting as well as the use of revolving flats to create the various settings and getting the cast on and off quickly and quietly. The painted scenes of the North Pole with snow covered hillsides and Evergreen trees are cute and serve their purpose but might be a little plain for such a fun show. However, overall, the scenic design is bright and very fitting for this piece. It’s worth mentioning the inventive, working conveyer belts in Santa’s workshop add great value to this production making for a well-thought out set. To set the mood, Lighting Design by Stephanie Lynn Williams and Amy Williamson use the lighting wisely to show contrast between the bright and busy North Pole to the downtrodden and dark Bluesville. Lighting is appropriate and does not take away from the production but blends in making for smooth transitions and gives the correct cues to what feeling each scene has. Veteran Costume Designer Andrew Malone never disappoints and this production is no different. Malone hits the nail on the head with this fanciful wardrobe for elves and dear old Santa Clause and citizens of Bluesville alike. Each elf costume is individual and adds to the characters and all the costumes are traditional, yet they all have a contemporary flair and Mr. Malone is to commended for his work on this production. As this is a show with music by the incomparable Harry Connick, Jr., it goes without saying there is a lot of music and it is, after all, a musical. So, with lots of music comes lots of dancing and Choreographer Rick Westerkamp has taken on this challenge with ease and has this ensemble dancing and gliding across the stage in each number accompanied by this fun and jazzy score. The choreography is well thought-out and is a great match for Connicks music. Speaking of Connick’s music, Music Direction by Dustin Merrell is superb. Though there is no live orchestra, the consolation prize is hearing the smooth, jazzy recorded voice of Harry Connick, Jr. himself tell the story of The Happy Elf in between the scenes. Merrell has a strong vocal ensemble and has them sounding fantastic in each number. These aren’t the old fashioned Christmas Pageant songs you’ll hear throughout the season, but new jazzy holiday show tunes and Merrell has the cast singing in harmony that rings throughout the theatre. Harry Connick, Jr.’s The Happy Elf is certainly a children’s show, meaning it is a show for children and directing this type of show can be tricky. However, Director Laura Greffen has taken on this challenge and has produced an unqualified success. Her vision is apparent and she understands the humor geared for a young audience, but also understands that parents and adults may be in the audience, as well, and she finds a happy medium to entertain everyone. She keeps the action moving and precise to stay within the 90 minutes, including the intermission and that’s perfect for any children’s show. Overall, Greffen gives us a well put-together and smooth running production. Moving into the performance aspect of this production, Todd Hochkoppel takes on the role of Mayor and though his is confident and comfortable in this role, his performance fell a little flat for me. However, that’s not to say he didn’t do a good job, because he certainly, like all of the ensemble, gave 100% to his character and understood what his character was about making for a good performance in general. re to an old time gangster moll, her acting chops weren’t stretched completely as her only expression was one of irritation and contempt, but she pulled them off very nicely. Sutter takes on double duty and portrays Coppa, an agent in “Gnomeland Security” and a nemesis of our hero, Eubie the Elf. Her talents are much better portrayed in this role and her performance is strong and entertaining. Santa, the big man himself, is played masterfully by Dean Allen Davis and I’ve got to say, he’s a pretty spot on Santa Clause with a big, resonating speaking voice that booms throughout the theatre. However, his singing voice isn’t as strong, but he still makes a good showing as the joyful old man that has a tummy like a bowlful of jelly. Seth Fallon takes on the role of Norbert, the curmudgeon head honcho Elf in the North Pole who isn’t a big fan of our hero and is by the book and waiting for our hero to falter. Fallon does a fantastic job as the stuffy, sour elf trying to ruin everything the hero is trying to accomplish and he makes the role his own. As good a job he does with the character, he does carry around an “assistant” that is a hand puppet and I’m still scratching my head as to the purpose of said puppet other than children always appreciate a funny looking puppet because it did not seem to move the story forward or have any importance at all. Regardless, Fallong gives a strong, confident performance. Molly and Curtis, the bad kids from Bluesville are played by Katie Ganem and Sarah Luckadoo, respectively. These two characters, mainly Molly, are the two kids Eubie the Elf is supposed to help see the light and the true meaning of Christmas. Both Ganen and Luckadoo do outstanding jobs portraying bratty kids running amuck in the town, causing trouble and not caring much about anything and Ganen as Molly, gets the point across that she is a neglected child, probably just acting out to get attention. Luckadoo is perfect as the “sidekick” and willing participant in the brattiness going on. The two actors have a great chemistry with each other and the rest of the cast making for wonderful performances. Megan Henderson takes on the role of Gilda, the sweet, shy elf who has a thing for our hero, Eubie, and Courtney Branch tackles the role of Hamm, the mechanic elf, who spends more time under a sleigh than inside of it. Both of these actresses were confident and comfortable in their respective roles and gave strong performances. Megan Anderson gives off an air of feminine cuteness that the character requires while she tries to get the attentions of Eubie and, most of the time failing, but for no fault of her own. On the other end of the spectrum, Courtney Branch, as Hamm, is very likeable and believable as the more tom-boyish character that just wants to help her friends. Both actors seem to understand the individuality of their characters and plays them accordingly making them a joy to watch. A definite highlight of this production is Cheryl Campo who plays Gurt, the wife of the Mayor of Bluesville. Aside from being very expressive and totally giving 100% to her role, this lady has a set of pipes on her! Though her solo number is a bit short, it’s easy to hear the strong vocals and they certainly shine through in the ensemble numbers, as well. Campo commands the stage quite well and is an absolute joy to watch. I look forward to seeing more from her in the future. Finally, we get to our hero, Eubie the Happy Elf, played skillfully by Justin Moe. Simply going on looks, I couldn’t imagine anyone else playing this role other than Justin Moe but, look aside, he had me sold from the start. He was able to keep the energy up the entire 90 minutes and is absolutely believable as this character, giving his all and taking the role seriously enough to bring the audience into the story. He obviously understands his character’s objective and each choice he makes moves his character toward that goal of making sure Christmas is enjoyed by everyone, even a dark, salty town like Bluesville. Moe is a pleasure to watch with his strong vocal performance, and assured performance that makes him a distinct standout in this production. Final though… Harry Connick Jr.’s The Happy Elf at Red Branch Theatre Company is a fun, feel-good holiday story that is a good break from the hustle and bustle of this season and it’s perfect for the family as a whole. The kids will adore it and the story is endearing for adults as well, reminding us what Christmas is all about. Take a break from the aforementioned hustle and bustle and take a trip down to Red Branch Theatre Company to join in on their merry making! That’s what I thought about Harry Connick Jr.’s The Happy Elf, playing at Red Branch Theatre Company… what did you think? Please feel free to leave a comment! Harry Connick Jr.’s The Happy Elf will play through December 18 at Red Branch Theatre Company, 9130-I Red Branch Road, Columbia, MD. For tickets, call the box office at (410) 220-6517 or purchase them online.